Last week was March Break for my kids so I took the week off from work. I didn't do any freelance writing or updates here on the blog. I barely even took any photos of my food. Well I did, but I used my phone...and I took the pics quickly, because food. My daughter and I travelled a bit to visit family and we ate lots of delicious restaurant meals. 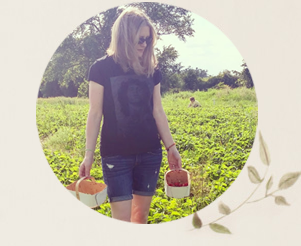 Because I didn't do a What I Ate Wednesday post last week, I am sharing some highlights from the last two weeks. 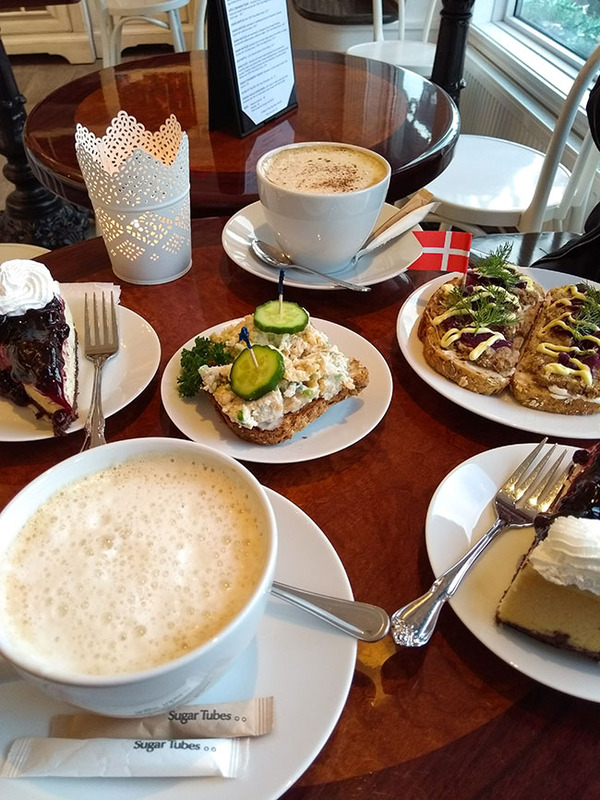 My many restaurant meals started with an amazing vegan spread at Vegan Danish Bakery (above). I met Lisa, The Viet Vegan, to have a chat and sample vegan goodies. We split two sandwiches - the Danish pâté sandwich and a vegan tuna sandwich. They were both very tasty. I also had blueberry cheesecake and a decaf soy latte. I definitely feel the need to go back there soon. The next day I took my daughter to shop for a Grade 8 grad dress. 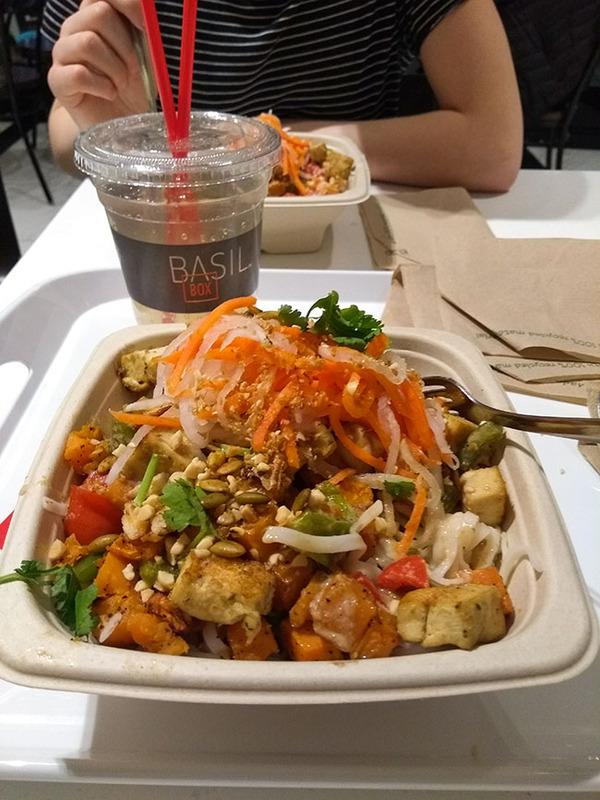 We had our first taste of the offerings at Basil Box, a restaurant that has you build your own box, using veggies, proteins, sauce and toppings. The vegan option for proteins is tofu and that's what we both had. The bowls (boxes) were huge and we found them very tasty. I would go back here again too. 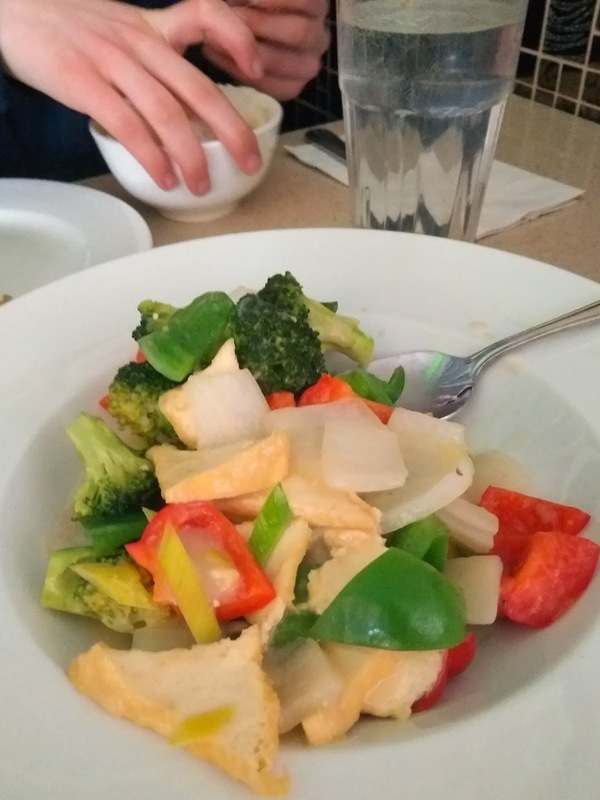 We headed to Hamilton for March Break and met up with my mom at Thai and Vietnamese restaurant Lemongrass. The server clearly explained to me which dishes could be made vegan. 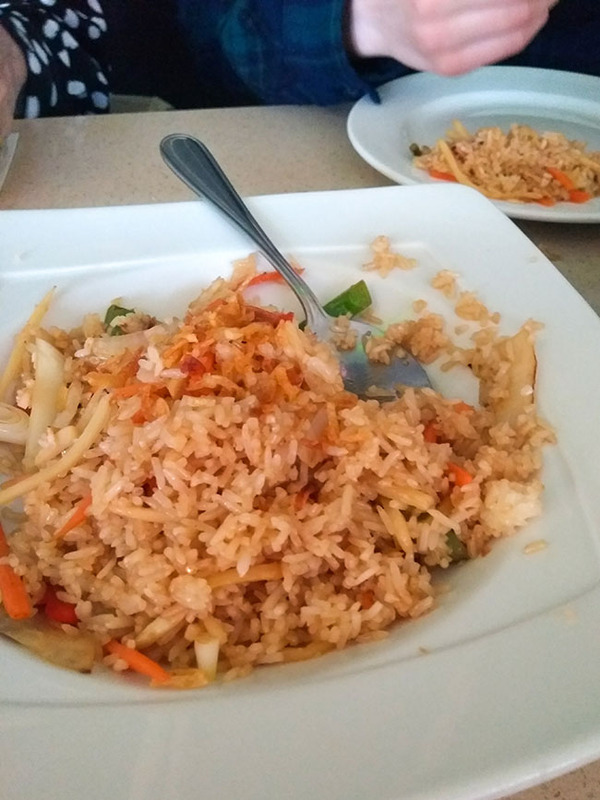 We opted for a tofu and mixed vegetables dish, above, and a rice dish, below. We stopped at the popular new bakery Donut Monster in Hamilton to take home some fresh donuts. Justin Trudeau stopped into Donut Monster the day we were there, but we missed him...of course.They have several vegan varieties, including those shown above. The pink one is raspberry, the one in the back is chai and I can't remember what the other one was. 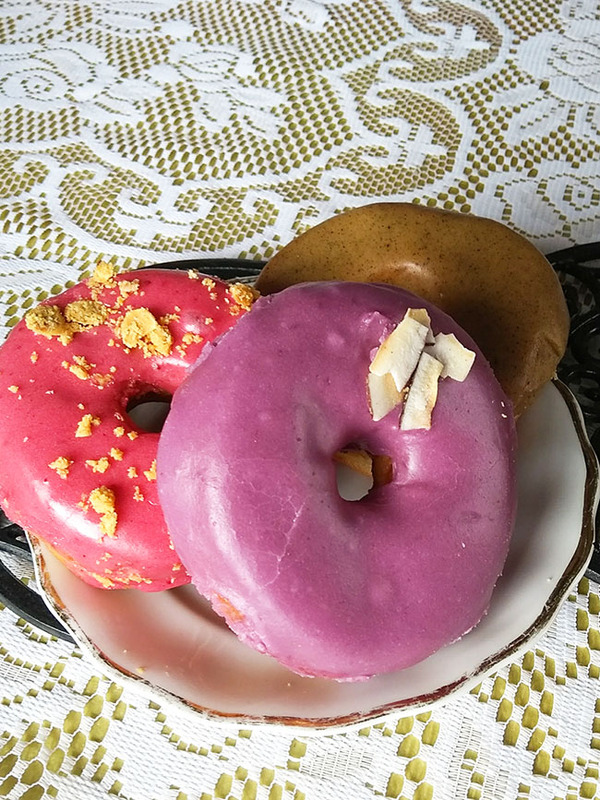 The base of the donuts was nice and fresh and chewy, but I found the flavourings a bit boring, especially compared to my fave (fully vegan) donut place, Beechwood Doughnuts. Also on March Break, my daughter and I stopped into The Minga in Dunnville for our usual lunchtime selections. 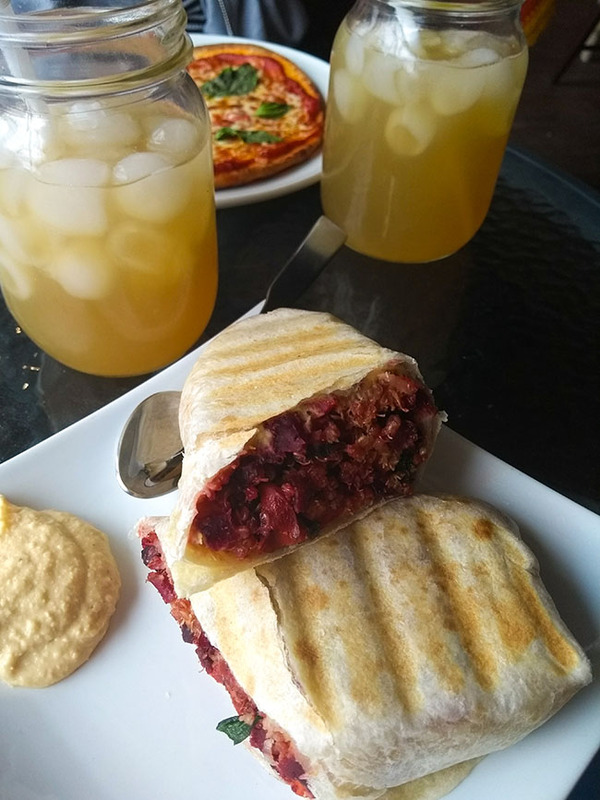 She had a personal cheese pizza (not vegan) and I had a quinoa and beet wrap. We also had fresh lemonades and took home yummy vegan scones. 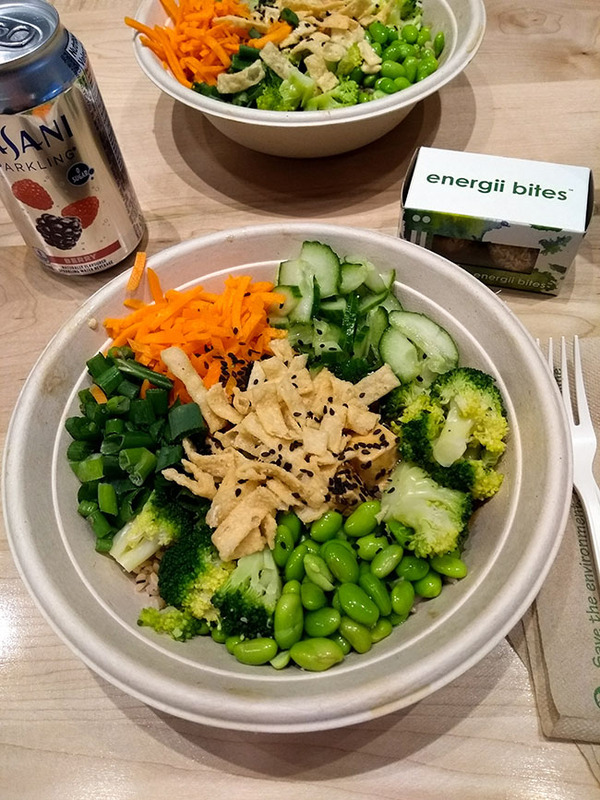 Returning home from our visit, my mom came with us, and the three of us girls stopped to eat at Freshii. Mom had a tortilla soup that she really enjoyed and my daughter and I had our favourite "Teriyaki Twist" bowls. The whole fam also went out for all-you-can-eat sushi at Sushi Kui. 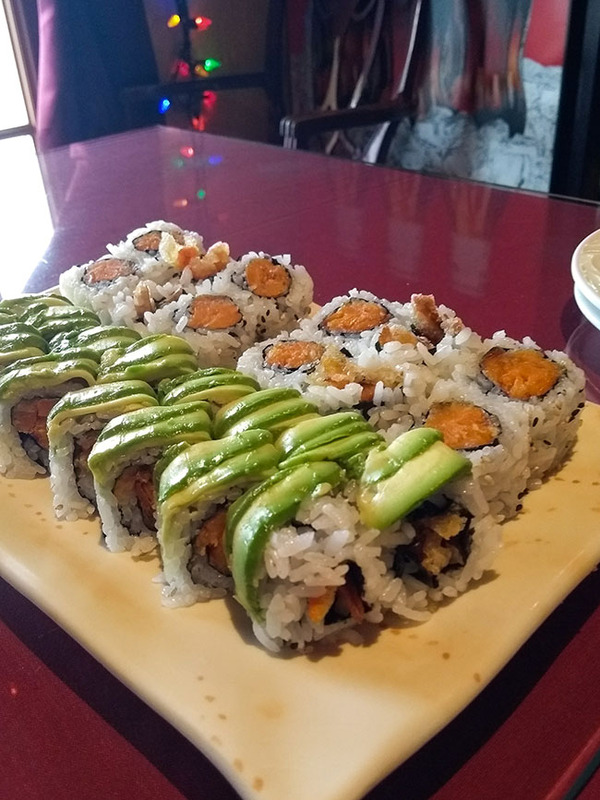 We especially like the veggie green dragon rolls. We didn't stuff ourselves quite as badly as usually, ie. we could walk comfortably afterwards. As if that weren't enough, my mom and I went out to eat lunch at Made in Mexico one day. I had a burrito - they make them up fresh so they can tailor the fillings to your wishes. 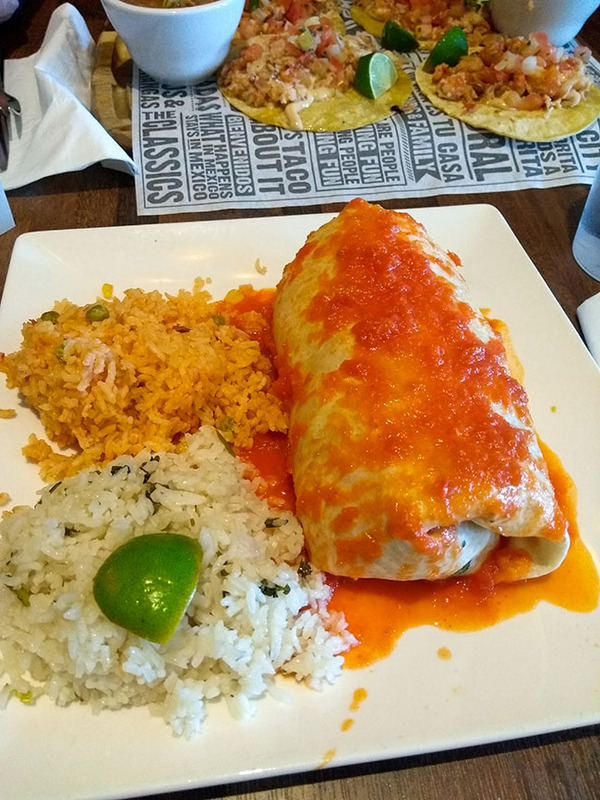 Mine was vegan and filled with refried beans, veggies and rice. So good. And now for a full day of vegan eats. Before I show you what I actually started the day with (yes, oatmeal once again!) I wanted to show you what I eat on those occasions when I'm craving something junky in the morning (or in the evening when I'm desperate and there's nothing much in the house). I have a little spice jar that I fill with 1 part cinnamon to 3 parts sugar. 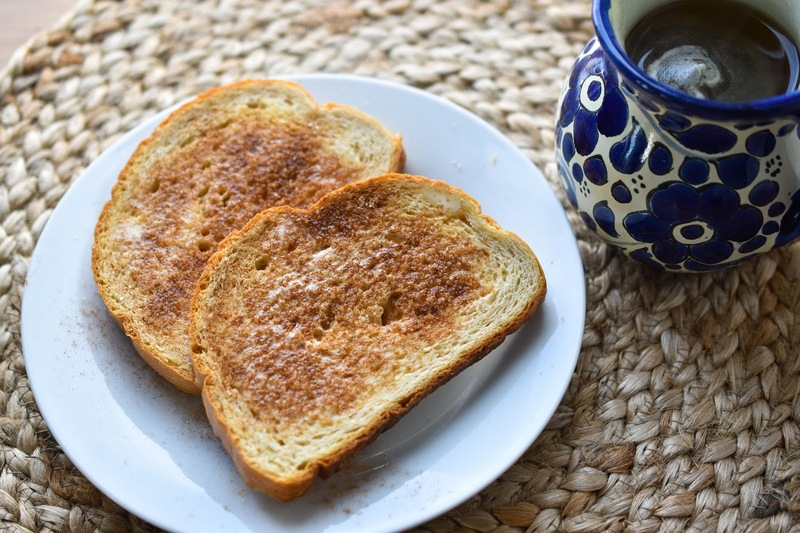 I toast bread, spread on margarine and shake the cinnamon mixture on, for a little treat. 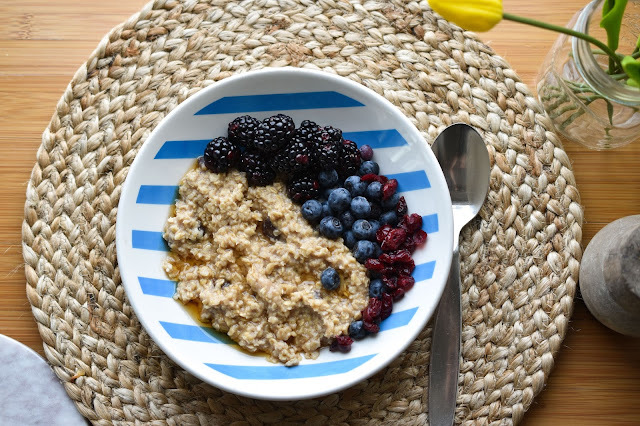 Okay, there's my more regular breakfast - oatmeal topped with berries, maple syrup and dried cranberries. I'm not showing lunch because I actually ate leftovers of the burrito and rice from the Mexican restaurant. 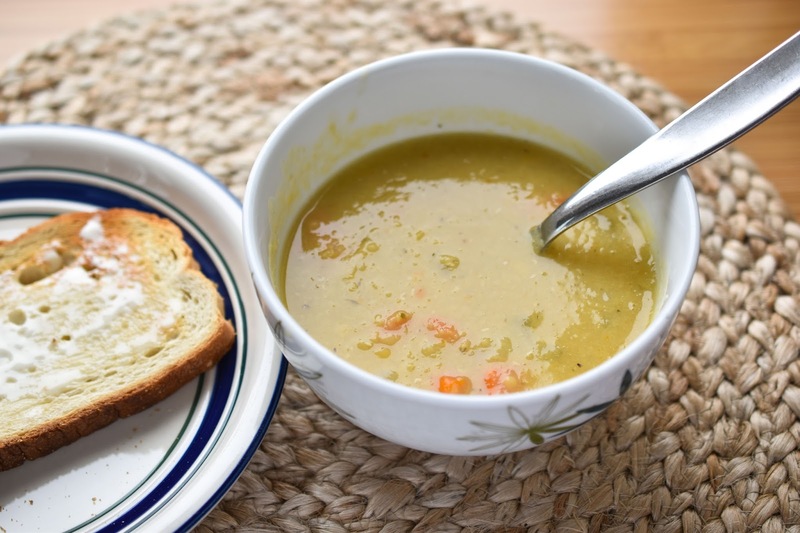 Dinner was this easy red lentil and vegetable soup, with some toast. Have you had your March Break yet? Will you eat your way through it too? Or maybe do something a little more productive, haha? I’m so jealous. 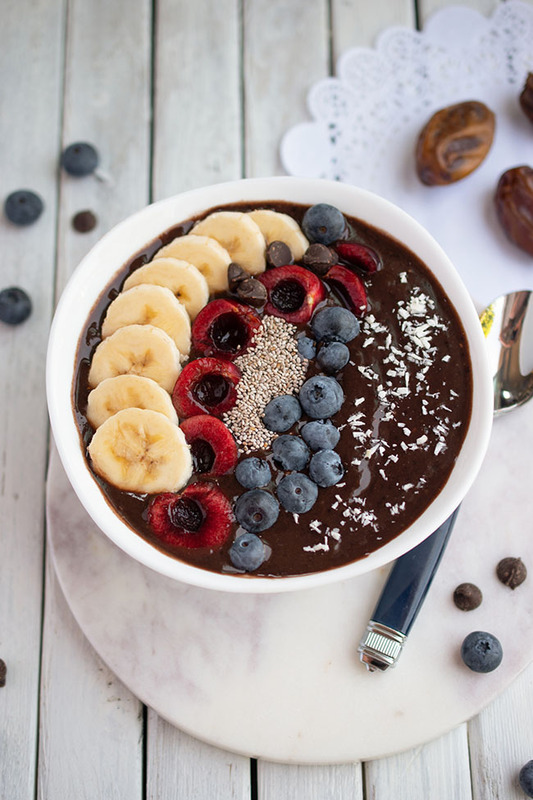 Your food looks so much yummier than mine lately! Thank you! But I can't imagine that - you guys always have some yummy stuff going on!